SG Gothic, SG-Shaped Guitar from Gibson in the SG series. The guitar is so well made it almost plays itself! The sound quality is fabulous and the build quality very good (in most areas). The guitar can produce a whole spetrum of different tones and just goes absolutely crazy with a large valve stack. It seems an altogether excellent guitar and I would recommend this model to anyone looking for warp factor 9. The finish; Oh dear. Matt black looks fantastic on anything, especially this guitar, but the lacquer that has been used is completely inadequate. The slightest knock or bump results in a white "bruise". 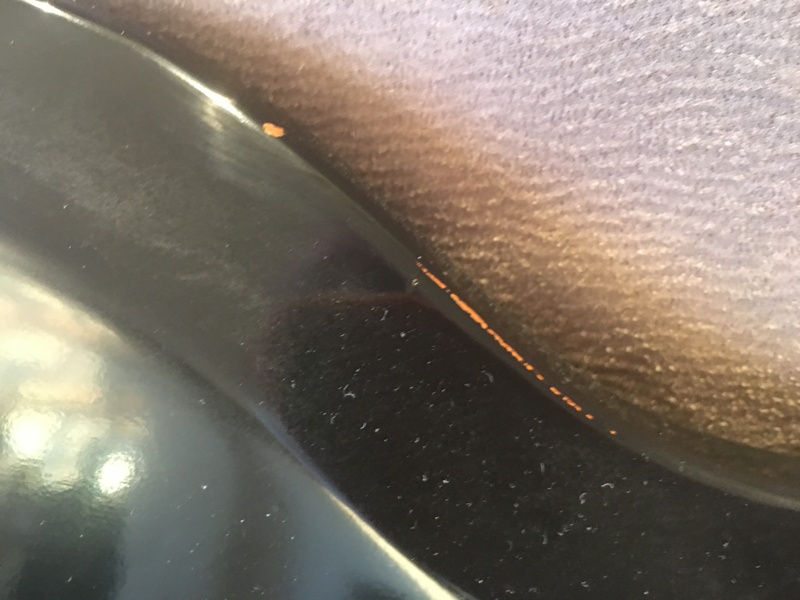 More to the point, the problem is greatest at the base of the machine heads, where the pressure of actually tightening them in during manufacture has caused bruising around each machine head. Not good enough from the world's finest electric guitar manufacturer. Construction is second to none - no apparent problems. I've owned many guitars and this one has as much quality as any I've ever played, (more in some cases). A proper case would have been nice, rather than the, albeit high quality, gig bag it came with. I'm a Gibson freak, so I'm (slightly) biased, but I don't regret my purchase at all. I love the little beast. I'm so impressed that I'm on the look out for agothic Les Paul and explorer to complete the new family. Go and buy one now! 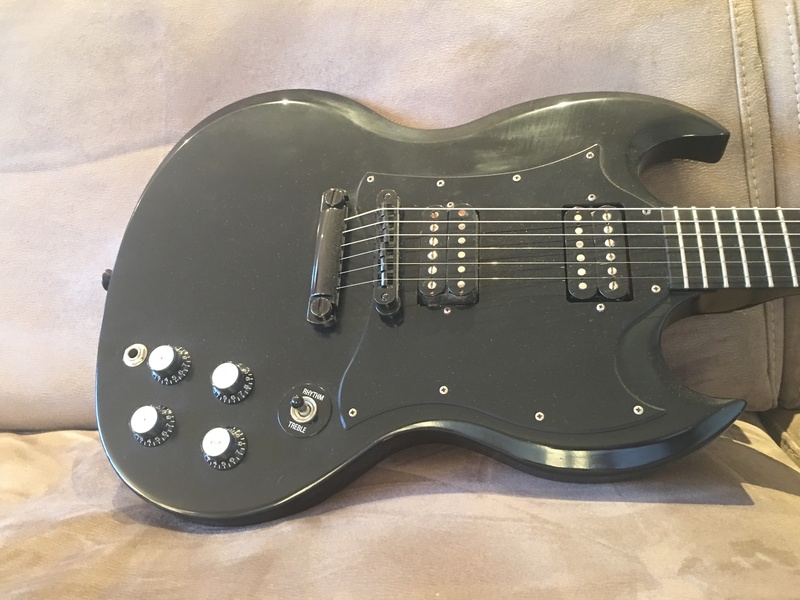 MGR/Nicholas E. Berndt's review"Gibson SG Gothic"
instead of all the usual cheap stuff I had been playin for so many years. I finally have the real musical instrument I have been seeking. guitar I have owned, an I have owned quite a few. The tone. Oh!... The tone! The guitar sings with resonance. It does what I tell it to do, and doesn't complain! It was made to be played. cosmetic reasons. Good, solid weight (this gives the guitar more sustain). The neck is smooth, not too thick, and lends itself to incredible playability. I intend to buy only one or two more guitar in my life. One will be another Gibson. what they're doing. It's the best guitar I have ever played or owned. 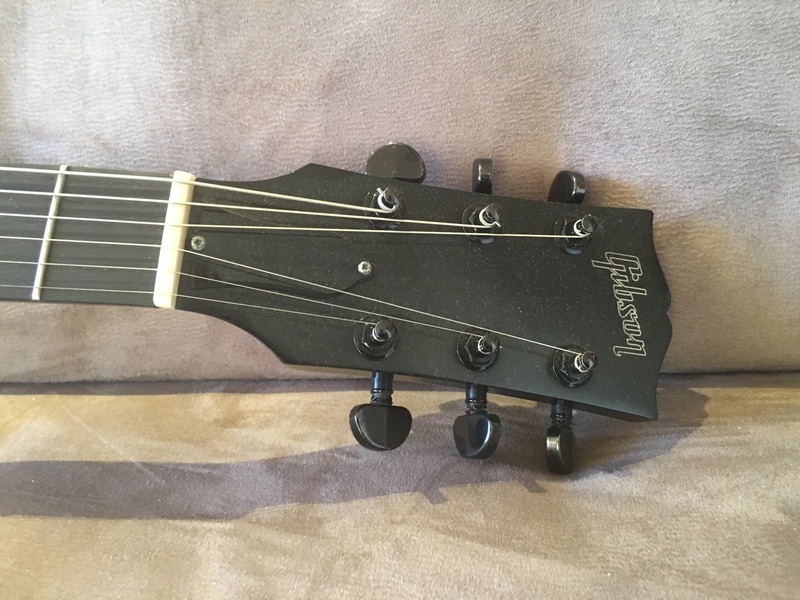 MGR/Poop Face's review"Gibson SG Gothic"
It plays really nice. It has a nice thick neck that feels great and the fingerboard is rather comfortable as well. The stock Humbuckers were really nice and warm sounding. The name of the guitar may imply that it is for metal only, but I have found it to be a very warm guitar with nice tone. Nice set-neck construction too. Well, I use a lot of harmonics when I play... and even though the bridge humbucker was nice, it didnt accentuate harmonics very well. I put a Dimarzio Evolution in the bridge, and I originally planned to put another Dimarzio in the neck, but the Gibson neck pickup just sounded too nice to get rid of. It was better than any of the other neck pickups I looked at. The input is put on a weird place on the body too. Its constructed very nicely, but is seems to dent very easily. I personally dont care about the looks as long as the sound is maintained... but if you are trying to keep it nice, I would suggest going and buying a hardshell case with it and handling it very carefully. Its a nice light guitar, and once again I must complement on the set-neck construction. This may be old news for some people, but I really enjoy the sound that it produces. I got a nice deal on this guitar, but looking back on it... I would have easily paid full price for a guitar of this quality. Ive always heard of Gibson having a great reputation, and now I know why. I dont much recommend the SG Gothic to Metal guitar players, basically because its a nice warm guitar that I feel fits progressive and alternative sound better than a screaming metal sound. Also its worth noting that after getting an actual Gibson, I feel it a better choice to go with Epiphone for my next guitar. I'm looking at an ES-335, but I'd rather not spend thousands of dollars on one. The Gibsons are great if you can afford one, but dont bust your bank for one kids. 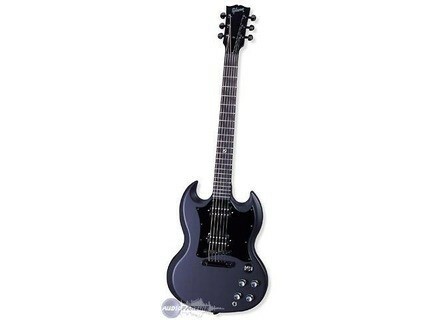 The Gibson SG Series Gothic has been used by myself for some blues, I purchased it used for around 550 usd at a local store. I am actually surprised that I got it for that price because brand new it cost over a 1000 dollars. 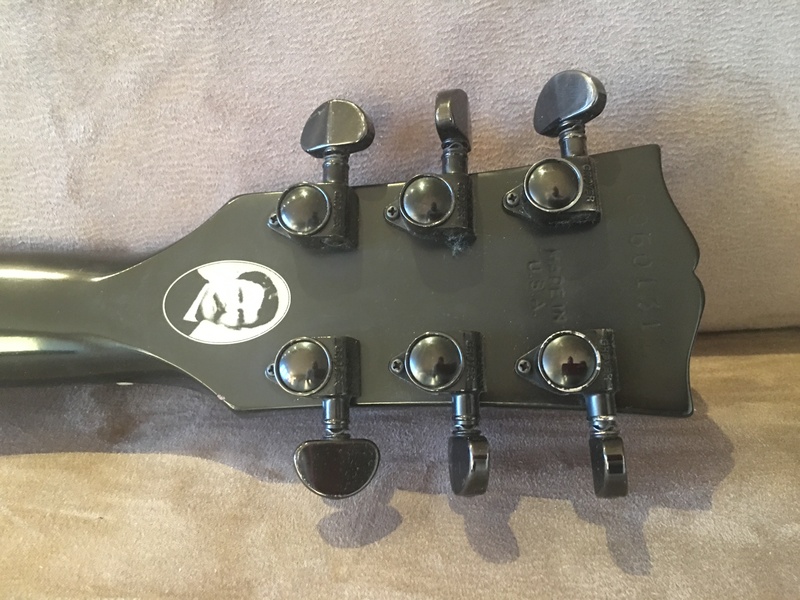 The Gothic models of the Gibson series has a star inlay on the fre board long with a picture of gibson on the back of the head stock. I remember getting this about a year after they came out so around the year 2001. I ended up passing it on to my younger brother who was just starting out at the time. This is a great guitar with a very nice feel to it when your using it. I didn’t really like how the frets where especially with the open E buzzing. But besides that I havent had any issues or complaints about this model. I really love how its all gothic black on black. Its just adds a nice look to it and I got a lot of compliments from other musicians when I as using this years ago. There are 22 frets on it and it just feels like a real natural classic guitar. It produces a fat sound that was used in a lot of music from the 80’s and early 90’s. But I really like it with blues it gives that real clean sound that I have grown to love over the years. Overall, you cant go wrong with this guitar, it also holds its value. I have seen many of these still be held at a very firm price today over ten years after it was produced. It is also very durable, You can bang it around without worrying about it getting chipped. Just don’t bang it around too much ! But it can take some abuse and not look bad. Its very easy to maintain as well. This guitar is well worth the money, its very stylish , sounds and looks great! Find one and buy it.